There’s a wide range of portrait photography, and every client is different. But as a photographer, sometimes you’re not necessarily shooting for the model, you’re shooting for someone else, like a clothing company or another commercial client. Or, maybe, the model has contracted you to take photos for their folio. Either way, fashion photography is a different kind of beautiful beast — and the posing can be tricky. In their class, Fashion Photography Posing and Lighting, Sue Bryce and Felix Kunze gave some great advice for portrait photographers who might be branching into fashion. Know the code words. “Ballet hands!” Sue emphasizes. If your model has stiff fingers or an otherwise problematic hand positioning, this is one of the quickest ways to direct her to correct it. 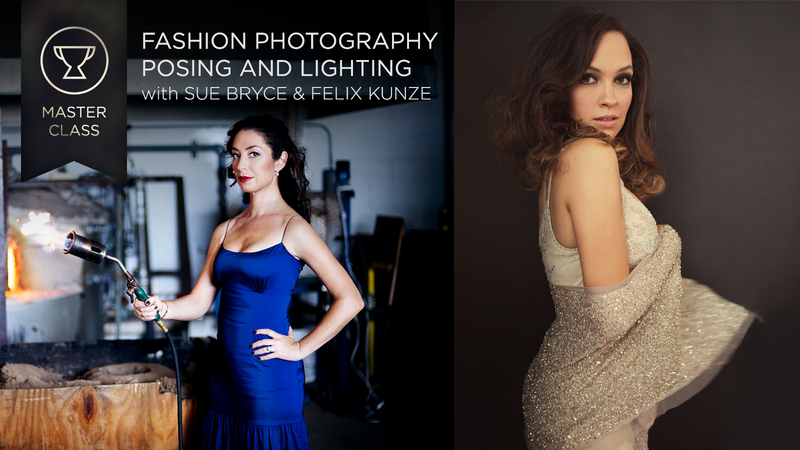 Bring more flair to all of your photographs with fashion-inspired posing and lighting ideas from Sue Bryce and Felix Kunze. Watch Now! Try anything. Different body types often merit different kinds of posing, but there really are no hard-and-fast rules when it comes to which shapes should or should not pose in which ways. The best way to find out what works? Try it, says Felix. Avoid phantom limbs. Cropping out limbs is a subject that photographers like to debate, but one thing that’s non-negotiable, says Sue, is posing that makes arms or legs look cut or shortened. One huge example: Arms between the legs in seated fashion poses. “When everyone starts out, they want to put their hands between their legs,” says Sue, “but then the arm…it just disappears. That’s a big example of what not to do.” Instead, move the arm around the knee or to the thigh — if the hand is visible, you’re in good shape. Have your own modeling material. “Don’t show another photo for [your model] to base poses off of. That’s just advertising someone else’s work,” says Felix. Instead, says Sue, you can either mirror your ideal poses yourself, or, as she’s done, draw out the poses you’d like them to do. Not a great artist? Sue put together a book of illustrated poses that will be available with the purchase of the class. If you’re going to touch, make it swift. “I never touch my clients,” Sue explains, “but if you do need to touch your clients, just go up and do it. Make it quick, make it confident. Don’t ask them if you can touch them, that’s creepier.” Sue recommends telling the model directly what she’s about to do, and then doing it swiftly. Take a breathe and do a lap. If you and your subject just aren’t in sync, or you’re having a hard time finding a pose that works, Sue says it might be time to stop directing and starting moving. “When you’re stuck, stop moving them — stop moving their hands, stop moving their arms — and rotate.” Take a few steps around your model and see how they react to your movement; often, they’ll shift and rotate to follow you, which can correct an awkward pose. “Just take your time. Stop moving her. Just start shooting. You’ll find it,” says Sue. Be specific. One huge way to help pose a model? Ditch that cliched photographer talk and really talk to your client. “Positive affirmation is better than just ‘gorgeous!’” says Sue. “That doesn’t mean anything!” Instead, she says, “hypnotize your clients.” Felix agrees. “When you’re really talking to her, it takes her mind off everything else,” he says. The post Sue Bryce and Felix Kunze Tips for Better Fashion Posing appeared first on CreativeLive Blog.